Just this week with the arrival of The Hobbit: An Unexpected Journey Chronicles, Creatures & Characters , fans got a sneak peek at an upcoming statue for The Hobbit: An Unexpected Journey. The character that was shown was Gollum, fully enraged at something down in his cave. Tonight, fans get to order this statue – and it’s a great companion, as you can see in the pictures, to the Bilbo statue previously released. 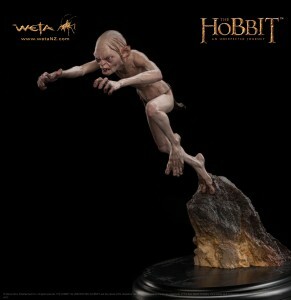 Gollum comes in at $249 and will be shipping sometime in May/June. There is no announced edition size with this statue.